Robert the Bruce was born in Turnberry, Scotland, in 1274. He inherited the title Earl of Carrick and in 1296 swore fealty to Edward I. However, in 1297 he joined the Scottish revolt under William Wallace and was appointed one of the four guardians of Scotland. In 1306 Bruce was crowned king of Scotland. After being defeated by the English army at Methven in 1306 he was forced to flee to Raithlin Island off the north coast of Ireland. Bruce returned to Scotland and defeated an English army at Loudoun in May 1307. Two years later Bruce was strong enough to hold his first parliament at St. Andrews. A series of military victories between 1310 and 1314 won Bruce control of northern Scotland. He also captured the castles of Edinburgh and Roxburgh. In the summer Bruce besieged Stirling Castle. Stirling was the last castle still left in English control, and Edward II decided that every effort should be made to stop it being captured by Bruce. Edward therefore decided to take the largest army that had ever left England, to save the castle. Scotland's army was not only outnumbered but lacked the experience of Edward's troops. Edward also had a large number of armoured knights and longbowmen, the two most effective forces in medieval warfare. Bruce, on the other hand, had very few of either and instead had to rely heavily on spearmen. Bruce made no attempt to stop Edward's large army from entering Scotland. He decided that his best hope was to force the English to fight on territory that best suited his limited resources. Bruce chose a site only two and half miles south of Stirling, by a stream called Bannockburn. The Scots took the high ground and, if the English were to attack, they had to advance on a narrow front between marshland and a thick wood. The English advance guard arrived at Bannockburn on the 23rd June. Sir Henry Bohun, the leader of the English party, recognised Robert Bruce. After fixing his lance, Bohun charged the Scottish king. Bruce darted out of the way of the lance and killed Bohun with a blow from his axe. The main English army arrived on 24th June. Gilbert, 10th Earl de Clare, who had brought 500 of his own knights with him, advised Edward to allow the men to rest for a day. Edward disagreed and accused Gilbert of being afraid of the Scots. Gilbert was stung by these comments and immediately ordered his men to attack. Gilbert gallantly led the charge but his horse was cut down and while he was on the ground he was killed by Scottish spearmen. However, while the English knights were assembling, Scottish spearmen, who had been hiding in the woodland, launched an attack. The English knights, still not organised into battle order, were forced to retreat. The English archers were called forward but before they could take effective action they were charged by the Scottish knights. After large numbers were killed the archers were also forced to retreat. Edward now decided to use his knights to charge the Scottish position at the top of the hill. As the English knights were forced to attack on a narrow front, the Scottish spearmen were able to block their advance. English archers tried to help, but as both armies were crushed together their arrows were just as likely to hit their own men as the Scots. Suddenly, English soldiers started to turn and run. Others followed and soon the English army was in retreat. The Scots charged after them. Many of the English knights were able to escape but those without horses, such as the spearmen and archers, suffered very heavy casualties. The battle of Bannockburn was the worst defeat in English history. While what was left of the English army tried to get back home, the Scots were able to take Stirling Castle. Bruce was now able to launch attacks on northern England and Berwick was captured in 1318. The Declaration of Arbroath was issued in 1320 and three years later Pope John XXII recognised Robert the Bruce as king of Scotland. Robert the Bruce took advantage of the accession of the young Edward III to force the English monarchy to accept the Treaty of Northampton which secured Scottish independence. 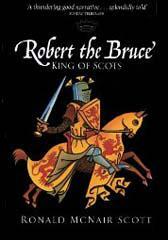 Robert the Bruce died in 1329. By John Simkin (john@spartacus-educational.com) © September 1997 (updated August 2014). Three of them went at King Robert, and the other two... made at his man. King Robert met the three and dealt such a blow at the first that he sheared through ear and cheek and neck to the shoulder... With that the King Robert glanced aside and saw the other two making a sturdy attack against his man. He left his own two and leapt on the other two and smote off the head of one of them... though he had a struggle. 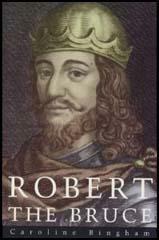 King Robert killed four of his foes. Robert Bruce triumphed single handed over all the ill-luck and numberless problems he had to face... With the Lord's help, by his own strength and by his human manhood he cut fearlessly his way into the columns of the enemy... in the art of fighting... Robert was the best in the world. (3) In 1307 a Scottish lord who opposed Robert Bruce, wrote a letter to the English court. For the first time it appears that God is openly for Robert Bruce, for he has destroyed all King Edward's power... the Scottish people firmly believe that Robert Bruce will win... Preachers are deceiving the people by their false preachings. For they have told them that they have found a prophecy of Merlin that the Scottish people and the Welsh shall band together and have the power to live together in peace until the end of the world. Robert Bruce's men, who had been concealed in caves and in woodlands, made a heavy attack on our men... For Robert Bruce, knowing himself unequal to the King of England in strength/ decided that it would be better to resist our King by secret warfare rather than in open battle. (5) In 1315 Robert Bruce sent envoys with a message to the people of Ireland. Our people and your people.., share the same ancestry... We have sent over to you the bearers of this letter, to negotiate with you about permanently strengthening and maintaining the special relationship between us and you. © 1997-2016 Spartacus Educational Publishers Ltd.